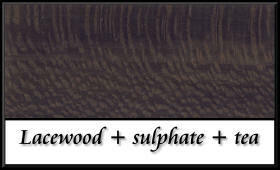 "When we talk about Harewood veneers we are mostly referring to Sycamore that has been stained, but unsurprisingly other veneers can also be treated. 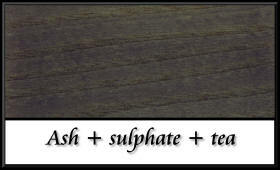 These are such veneers as Masur Birch, Lacewood and Ash, to name but a few. 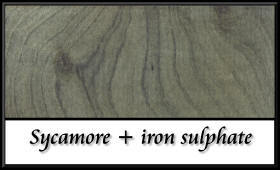 Most of the veneers used for this treatment are the light coloured veneers - although Oak takes this treatment surprisingly well, in fact it goes almost black when treated with the iron sulphate solution. A good example of this is when you see a piece of Oak used in say a building construction or a piece of furniture, and it has an iron nail driven through it at some time in it's life, you will see a virtually jet black ring around the nail in the Oak. 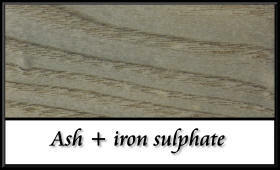 This is caused by the reaction of the iron to the Oak, it's a natural process that we make use of without having to resort to the auspices of the petro-chemically dyed veneers that are so obviously artificially coloured"
For the iron sulphate method of colouring veneers I would recommend the following proportions for making a sufficient quantity of solution for several large pieces of veneer. 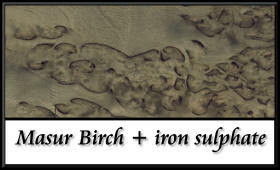 The iron sulphate we are going to be working with is easily available at most garden centres. The proportions are: 3 x tea spoonfuls of iron sulphate powder or crystals mixed or dissolved into about 2 x pints (that's about one and a quarter litres approximately) of water - it dissolves very quickly by the way. 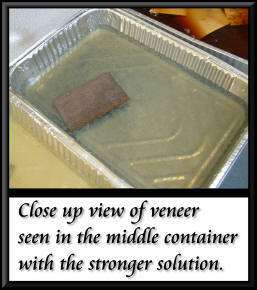 Pour the solution into a tray (an aluminium foil food tray as seen in the accompanying photos is ideal) and then place your veneer into the liquid and leave it for about twenty minutes. 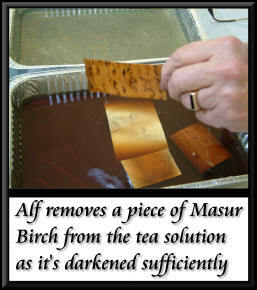 After the allotted time remove the veneer and rinse it under cold water and then place it between some sheets of paper kitchen towels, place under a weight and leave it overnight. Do not use any form of news print as the ink used for the print could be transferred onto the veneer - and if this happens it is virtually impossible to remove - so take care. 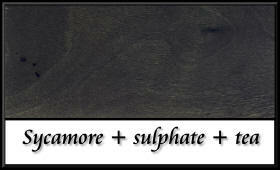 To obtain a darker shade for your iron sulphate solution soaked veneers, try the tea method! Make some tea, say 3 or 4 tea bags (or the equivalent in loose leaf tea) for a pot full of tea, and allow it to brew for at least 10 minutes. 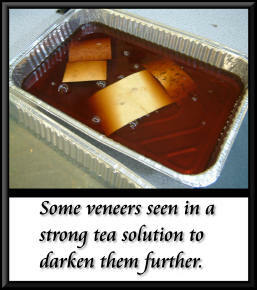 Pour it into one of the aluminium foil food trays and immerse your veneer into the tea solution and leave it for about 20 minutes. 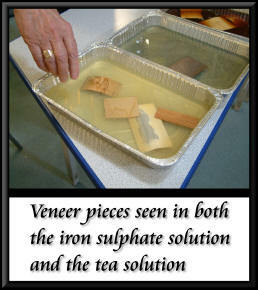 Rinse the veneer under cold water and then place your veneer in the iron sulphate solution and follow the instructions as already described previously. 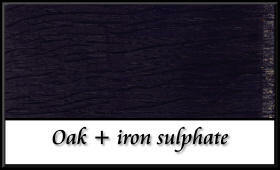 Note that Oak if placed in a solution of iron sulphate will turn deep blue or nearly black. 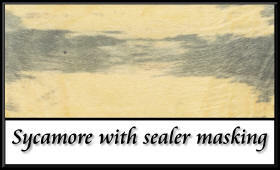 To get a cloud effect on Sycamore, rub three coats of cellulose sanding sealer onto the veneer, leaving patches untreated (the sealer will be the cloud and the untreated sections will be the clear sky parts). 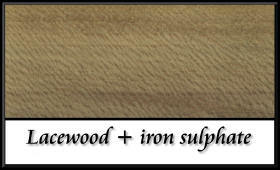 Now that we have seen how the harewood veneer is made, let us take a look at several examples of treated veneer. 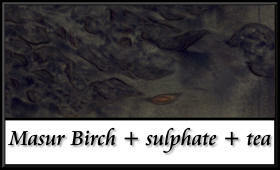 The examples you see were treated in iron sulphate and tea solutions as apprpriate. We hope you find them inspiring and easy to do. 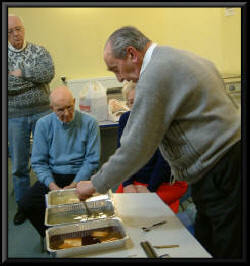 Have a go yourself and be amazed at the effects you produce.